Here are a few simple tips that can help you get more from your vegetable gardening space. Not only will you improve your yield per square foot, you may also improve the appearance of your garden and reduce your maintenance work. Some intensive gardening techniques can also reduce weed growth and water requirements. You can improve your yield per square f oot by going, or growing, vertical. A row of pole beans can yield 3 or 4 times as much as a row of bush beans. 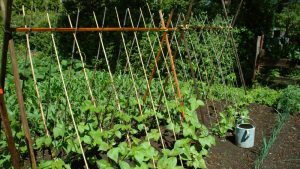 And, if you plant the row on the outer edge of your garden, you only need one small path on the inside of the garden to pick beans from both sides! 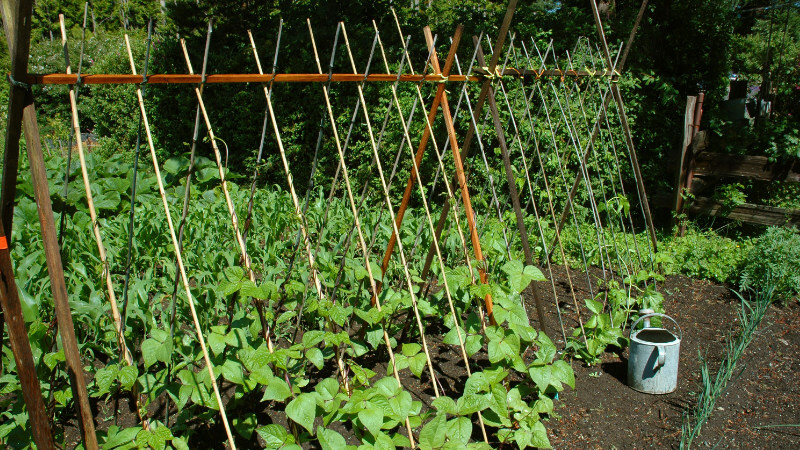 Vine crops, like squash and cucumbers can be grown on trellises or netting, too. Plant blocks of vegetables three or four feet wide to reduce the number of paths in your garden. This is the method used by raised bed gardeners to get the most out of the space available. With fewer paths, you’ll have less soil compaction, and may actually need less water. Early season crops, like broccoli and cabbage, can be followed by quick-growing crops like lettuce, spinach, radishes, and even quick-maturing summer squash. With a little cultivating and some additional compost or organic fertilizer, you can get two crops from one area. One of the best ways to grow indeterminate tomatoes is to contain the plants in round cages made of heavy wire mesh. Our favorite cages are made of “turkey wire” that has 2″ by 2″ openings. Theyre 6 feet tall and 30 in diameter. Use wire cutters to make several access holes to reach the tomatoes. And, be sure to stake the cages to the ground, as they’ll become “top heavy” late in the season. Your vegetable garden productivity will almost certainly improve if you consciously use mulch. Shredded leaves, grass clippings, and straw can help retain soil moisture and reduce weed growth both which will improve your productivity and reduce the amount of time you need to spend weeding and watering. For many gardeners, the biggest obstacles to growing more vegetables are cramped spaces and shade from buildings or trees. Don t let these challenges keep you from growing great food and trying to maximize your garden production. You’re absolutely right Darren! Good point.